21. Keeping track of supplies in the printer. 23. Hardware pages meters for printers or multifunction devices. Any user using a printer can be included in a user group. You can view statistics on each user group. You can also assign a printing quota for each user group. The quota will apply to all members of the group. 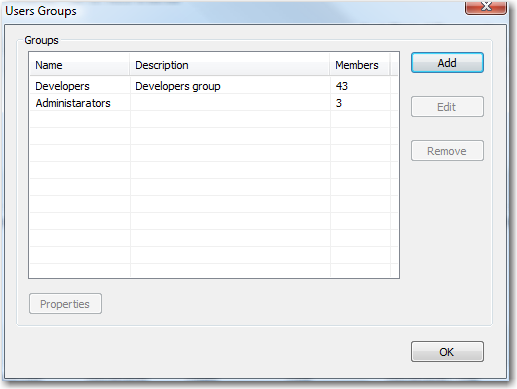 To manage user groups, select User → User Groups in the menu. 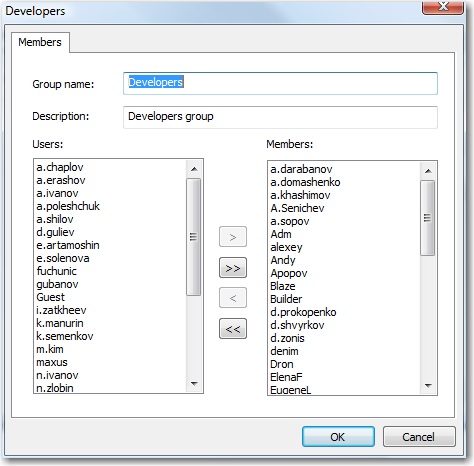 In the User Groups window, you can see all user groups, including the description and the number of members in each group. Use the Add, Edit, and Remove buttons to create, edit, or delete a group. IMPORTANT: Only an empty group can be deleted. So before deleting a group, you must remove all members from that group. IMPORTANT: Each new user is automatically added to the database as soon as he/she prints his/her first document. You can import any users or user groups, local ones or from Active Directory. To do that, select User → Import Users in the menu. Printing history reports on user groups. You can view printing statistics on user groups on the Users tab in the tree on the left side of the program’s main window. You can view summary reports on all groups, or detailed reports on members of a specific group. Group or Group member — The name of a group or group member. Documents — The number of documents printed. Size — The size of documents printed. Pages — The number of pages printed. Cost — The cost of documents printed.